As the weather warms, snake identification requests are becoming more common on my blog. 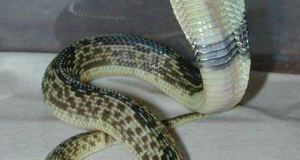 Of most concern to those unfamiliar with reptiles is the possibility of encountering venomous species. Often, a fleeting glance is all that has been had, and identification proves very difficult. So today I’d like to direct folks to some useful online and published resources that are useful to review before a snake is sighted as well as after. Of course, please continue to post your questions and observations as well…some species are quite distinctive, and other times the location of the sighting or certain behaviors can be used to narrow down the possibilities. I’ve been involved with snake bite response efforts through the Bronx Zoo and other organizations for most of my working life, and have learned that, in the USA, most bites occur when people disturb snakes or keep venomous species as “pets”. Worldwide, the situation is different, with an astonishing number of people being bitten, often fatally, in the course of their daily activities (please see the article linked under “Further Reading”). Please heed the cautions provided below. Note: The following information should not be used to determine if a snake is safe to handle or approach, nor should any other printed guideline. Aberrations in color or pattern, injuries, hybridization and other factors – including the very real possibility of escaped non-native “pets” – can render identification impossible to all but a well-seasoned expert. Concerning exotic escapees, bear in mind that we still have much to learn…and that two prominent herpetologists were killed by snakes thought to be relatively harmless! Also, please note that the flood of both accurate and outright ridiculous information on the internet sometimes inspires a feeling of false confidence in the inexperienced, and gives credence to the old saying “A little knowledge is a dangerous thing”! The primary resources listed here are based on Florida’s venomous snakes. However, Florida is home to representatives of each type native to the USA, and the state’s museums and universities have a long history of fine educational efforts in this area. Specifics as to species found in other parts of the country will vary…please see the notes on field guides, and post below if you would like a guide to the species present in your state or region. Prepared by the Department of Wildlife Ecology and Conservation, Dealing with Snakes – IS IT VENOMOUS? 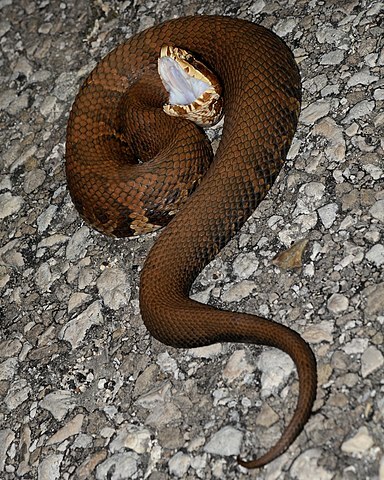 provides a great overview of the 4 general types of venomous snakes found in the USA – copperheads, rattlesnakes, cottonmouths and coral snakes. The most easily-recognizable characteristics of each are highlighted, which makes it simpler for inexperienced observers to decide whether a harmless or venomous snake has passed their way. 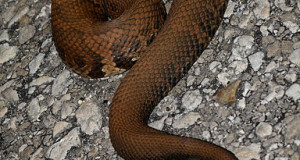 You can also view individual pages on each of Florida’s venomous snakes. These include additional characteristics, habitat notes, photos, range maps and other useful details. 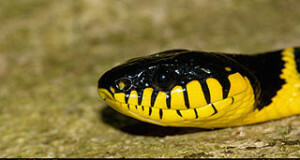 The FMNH Snake Identification Key is based on the detailed identification tools used by professional herpetologists and serious snake-watchers. However, it has been modified to focus on color and pattern only – those characteristics that tend to catch the average observer’s attention, and which are easier to recall than finer details. Once you’ve eliminated characteristics that do not fit the snake you’ve seen, and have made a tentative identification, you can click on a photo and see if it matches your observation. Using keys to identify a snake can be fun, and it’s easy to turn the process into a game that children will enjoy and benefit from. I’ve relied on the Peterson Field Guides and their predecessors since childhood, and they remain the gold standard for on-site reptile and amphibian (and other animal) identifications. There is also a “first field guide” series and a wonderful field guide coloring book for children. Please check here for further information on these. Working with Spitting Cobras…and Getting Snake Venom in My Eyes!